Marvel closed out their successful Phase Two this year, adding two more box office hits to its impressive track record, Avengers: Age of Ultron and Ant-Man. In just a few months, Phase Three kicks off with two highly-anticipated adventures, Captain America: Civil War (May 6, 2016), followed by Doctor Strange (November 4, 2016), but that's just the tip of the iceberg. 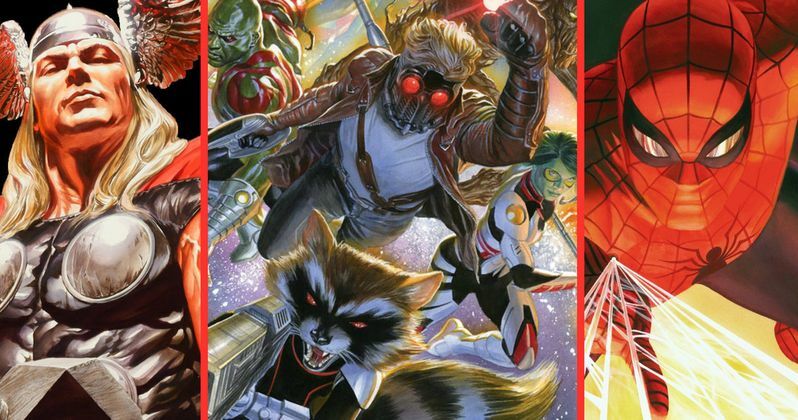 2017 will bring three more MCU movies, Guardians of the Galaxy Vol. 2 (May 5, 2017), Spider-Man (July 28, 2017) and Thor: Ragnarok (November 3, 2017). Kevin Feige recently spoke with Empire Magazine, where he shed some new light on all three of these projects. The studio's announcement of Spider-Man joining the Marvel Cinematic Universe is easily among the biggest news items of the year. The new Peter Parker, played by Tom Holland, will be introduced in Captain America: Civil War, before the stand alone Spider-Man hits theaters in the summer of 2017. We know that this new Peter will be back in high school, with Marvel and Sony eschewing the traditional origin story, showcasing the character already established as the web-slinger. While we don't have many confirmed plot details, Kevin Feige addressed the rumors that this movie will be done on a smaller scale than the previous versions. "Smaller scale is all relative. It's going to be as big and spectacular a Spider-Man film as has ever been made. But it's a Peter Parker story and has more opportunity to be focused on the story of a 15-year-old kid going to high school." As of now, Tom Holland is the only confirmed cast member, with Marisa Tomei in talks to portray Aunt May. It isn't known when production will get under way, under the direction of Jon Watts, but hopefully we'll learn more about the cast of characters, villains and much more. In regards to Guardians of the Galaxy Vol. 2, many fans have assumed and/or hoped that this sequel will give us another glimpse at Thanos (Josh Brolin). As it turns out, though, fans shouldn't expect to see much of the Mad Titan in this sequel, adding that the Guardians roster will be expanded in this sequel. "There've been many different incarnations of the Guardians over the years in the comics and we'll catch a glimpse of additions over the course of the movie. I wouldn't look too hard in that movie for Thanos. The next time we see Thanos he will not be messing around. It will be, 'Oh, that's why they've been teasing this villain for five years!" Unfortunately, the producer didn't reveal exactly when we'll see Thanos again. Of course, his presence is certainly expected in the two-part Avengers: Infinity War Part I and Avengers: Infinity War - Part II, but whether or not he'll show up before then remains a mystery. Finally, the producer/studio president offered an update on Thor: Ragnarok. Most have assumed that the title refers to a cataclysmic event that happens in Asgard, since the Norse word Ragnarok literally translates to "apocalypse," but the producer revealed that may not be the case. He did add, however, that the movie largely takes place "within the cosmos," and not on Earth. "I don't think people will read into that title alone [regarding] what the movie's going to be. It's going to be, perhaps, as totally different from the two prior Thor movies as Winter Soldier was from the first Captain America. We want to take it to new places, we've got new characters that will show how big we're swinging on this. And we have a Hulk. The film takes place within the cosmos primarily which is to say, frankly, very little Earth." It was previously reported that Mark Ruffalo's Hulk will be going on a "cosmic road trip" with Chris Hemsworth's Thor, but no further plot details have been revealed yet. What do you think about these new updates for Guardians of the Galaxy Vol. 2, Spider-Man and Thor: Ragnarok? Chime in with your thoughts below, and stay tuned for more on the MCU.